Here I am using French Ultramarine Blue, very wet (like a weak tea), to begin building some shadow areas in my painting. I squint at the photo reference to see where the darkest shadows are. I don't want to over-do this as it will make the flower look too dark and dull. 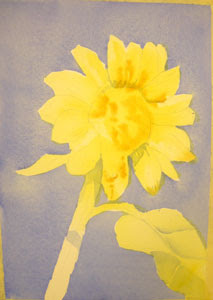 The blue underpainting will, however, add a darker value to subsequent warm colored washes.